There’s few things in this world that are more likely to make me do a delighted spit-take than old, forgotten Volkswagen prototypes and design concepts. This morning someone named Olivier, of the amazing Car Design Archives Facebook group, sent me what’s basically the VW geek’s equivalent of a full shot of deep-fried heroin: pictures of a 1970 VW design study for the Super Beetle. A four-door design. After breathing into a paper bag to regain my composure, I took a moment to consider what I was looking at here. The image shows a scale model built by the VW factory, and designed by Herbert Schäfer, who was VW’s head of design from 1972 to 1993. This concept dates from 1970, so Schäfer wasn’t the big schnitzel just yet. Before I get into too much detail about this concept, let’s talk about the Super Beetle itself. Essentially, around the late ‘60s, Volkswagen was starting to realize that, hey, this 1938-vintage design we’ve been selling by the boatload for decades may finally be starting to show its age. Japanese cars were especially worrisome, giving buyers more luggage space, more power, more modern features, hell, more almost everything for less money, mostly by virtue of being designed well after WWII. So, as a way to at least try to update the Beetle a bit, they started development on the VW 1302, which we call the Super Beetle. By switching to McPherson struts up front, they got 86 percent more luggage space (which was the main goal) and some better handling, which was nice. The first version of the Super Beetle came out in 1971; by 1973, an even more updated one (called the 1303) appeared, with a large, curved windshield and a real dashboard, changes made in response to expected new U.S. safety regulations and to improve interior room and passenger comfort. The Super Beetle was the most radical development of the Beetle up to that point, and yet, it was still basically just the minimum VW could get away with. 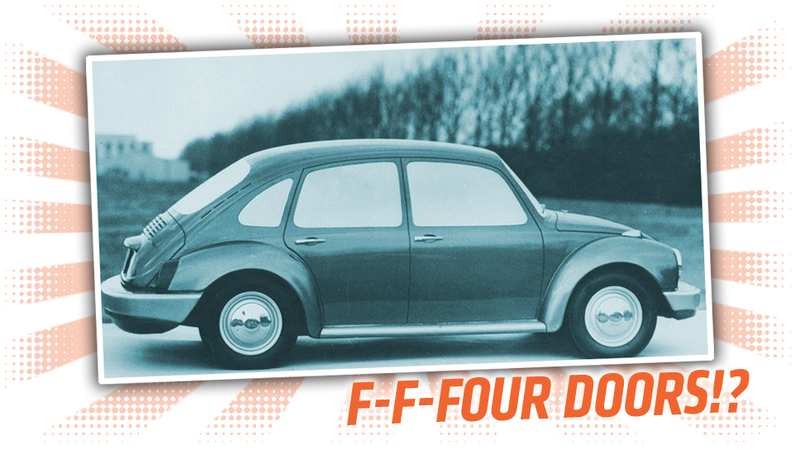 What I never realized was that VW’s iron-gripped design conservatism regarding the Beetle wasn’t universal, and this design concept proves that more radical ideas were at least being considered. And this design concept absolutely is radical, at least by ‘70s VW standards. The cutaway drawings show a two-door version as well, so it looks like four and two-door versions of this evolved Beetle were being considered. Even if we set aside the four-door variant for a moment, Schäfer’s design would have been a dramatic modernization of the Beetle. The front hood gets a flattened bottom, and the distinctive butterfly-like signature stamped design in the hood is severely simplified, to an unbroken center recessed area with a subtle center crease. The roofline and rear decklid have been pulled outward for a more graceful slope, and the bumpers look surprisingly modern, as flush-fitting units that form the lower valences as well, a far cry from the old curved chrome extrusions on brackets set well away from the body. The rear also eliminates the traditional row of vertical vent slots under the rear window, and instead relies on a set of five ventilation clusters in the decklid. I always wonder why VW never experimented with opening hatch-like rear windows to give access to the rear luggage well; Hillman Imps used this approach, and a few aftermarket companies made them for Beetles, too. It always seemed like such a good idea. Overall, this has a surprising amount in common with the modernized, streamlined 1997 New Beetle design, when you look at it. The four-door variant is even more surprising. At this point, Volkswagen had always been weirdly adverse to four-door cars, with their up-market Type 3s never having them (well, outside of Brazil), and only one of the new even more up-market Type 4s having four doors as an option. You could get four doors on a VW Thing/Type 181, but that car didn’t really cater to the mainstream four-door buyer. A four-door Super Beetle is an interesting idea. With the Type 3 and 4 sales disappointing, it might have been smart for VW to drop the Type 3 and lower-end Type 4s in favor of a mid-range based on the four-door Super Beetle. The Beetle was their iconic vehicle anyway, so why not leverage the legendary name? I’d just hope that if they’d gone through with this, they’d have installed maybe the Type 4's higher-output engine in a four-door Beetle, because I’m not sure the stock 1600cc engine would have been that peppy hauling around those extra doors. Schäfer’s design, I think, deals pretty well with expanding the Beetle out to four doors. This had only really been tried seriously (as in not just a one-off custom job) once before, by Rometsch, who built some four-door Beetle-based taxis in the early ‘50s. The result here I think has a little bit of a Saab feeling to it, especially with the little quarter window fragment left in the D-pillar. Of course, in the end, Volkswagen ended up taking the quickest, cheapest route to modernizing the Beetle, and the 1303 Super Beetle we all know was the result. I just can’t help but wonder what kind of a lifespan the original, rear-engined Beetle may have had if VW had been a little more permissive in their approach to design and development? Maybe it would have ruined everything? Or maybe there’d still be a fun, rear-engined, entry-level car on the market? I have no idea.